The South Indian city of Mysore is known for its temples and palaces, but in the last few years it has also become South India's centre for yoga studies. For tourists travelling in South India Mysore is a great destination to spend a few days. The city is small by Indian standards, and easy to get around. Until India's independence Mysore, and a large area surrounding the city, were ruled by the Wodeyar family of maharajas based in the Mysore Palace. The palace is built in an Indo-Saracenic style and is worth visiting both during the day and on Sunday nights, when the 97 000 light bulbs that decorate the palace and the palace grounds are lit at 7pm. During the day one can spend hours wandering around the palace and admiring its mosaic floors, beautifully decorated ceilings, intricate wood carvings and a throne made of solid gold. The Jaganmohan Palace housing the art gallery is in itself a master piece. You may not be allowed to take the snaps but you can always buy colorful post cards of all that you saw inside the palace and thus keep the memory intact. The rich and eye-catching facade of the palace, the durbar hall where royal meetings used to take place, the colourful paintings which acts as visual records of some royal events and the very many artifacts therein serves to provide a glimpse of the rich, royal life. The palace and the art gallery can be visited any day (before 5pm). Chamundi Hills, housing a temple dedicated to the royal family's patron deity. The 40 m "Gopura" at the entrance, the colorful statue of the demon Mahishasura (from whom the city got its name) and the 5m high statue of Nandi (bull) carved out of solid rock are the main attractions here. You can either take the road to reach the hill top or climb 1000-step stairs. The temple is small but busy, and is surrounded by a chaos of flower sellers, souvenir sellers, postcard sellers and beggars. Ask anyone about Mysore and the first thing they tell you is about the beautiful Brindavan Gardens. This garden-park adjacent to Krishnaraja Sagar (KRS) Dam represents a marvel of civil engineering achievement in pre-independent India. The Garden is dotted with beautifully lit dancing, musical fountains. Yes, the fountains are made to jump and dance to the tune of music. Weekend evenings are the best time to see the garden with illumination at its rare best. 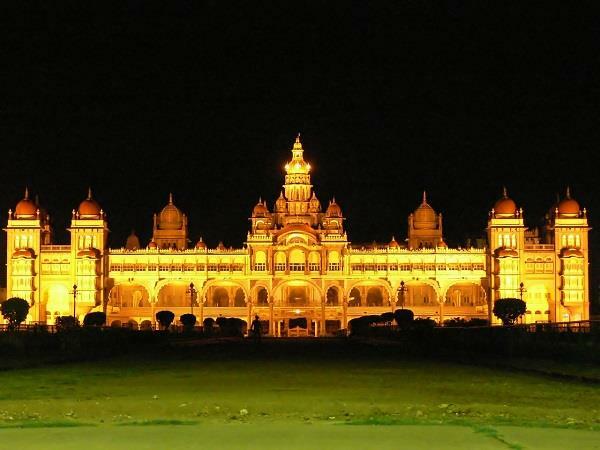 There is in Mysore the town of Srirangapatnam where the summer palace of erstwhile King, Tipu Sultan is located. The variety offered by Srirangapatnam is rich and classic with its monuments and forts silently telling the historic tale of Mysore and its dynasties. The summer palace Dariya Daulath (meaning "wealth of the sea") with its elaborate arches, ornate ceiling and breath taking range of classical paintings was Tippu's favourite retreat. So, these were some beautiful tourist attractions in Mysore city of India. You can share more places with us by commenting below. I recently visited the Chamundi hills located in Mysore. It was an awesome trip. You can watch picturesque view of Mysore from the top of the hill.